Paradise may just be a moment away . . . . . Living where I do in New Zealand has one major drawback. Sure the expansive ocean views I have are incredible, sitting on the veranda watching the sunset over the horizon is spectacular, living in the heart of 'middle earth' is a dream . . . but yes it has its drawbacks. Sure we have some of the best local produce one can wish for; in fact in my freezer right now I have some prime New Zealand lamb and beef, wild boar, venison, kangaroo and even some crocodile! I can grow virtually anything in my garden because of the climate . . . for my Thai dishes I just pop out and pick some fresh kaffir lime leaves right off the tree. But the one major drawback, well at least for any chef, is the fact that we have little in the way of ethnic restaurants . . . I can not just pop out for some sushi, it is not a short drive to the local Dalmatian Deli, or a brisk walk for some well earned Spanish tapas and a cold beer after a day in the kitchen. These 'treats' are a three hour drive away through alpine roads or a twenty-five minute flight over the southern alps to Christchurch. So I guess one cannot have it all . . . one can not have one's cake and eat it too! Or can you? When I want any of these ethnic dishes I have to wait until my next trip away . . . or make it myself! A treat and a challenge for a chef. One of my favourite dishes, one of my standbys, that can be easily produced when a great dessert is required, is Baklava. Hailing from many of the Mediterranean countries - it is popular in Greece, Turkey, Morocco and many others. No doubt many of you have tried it on your travels or at your local deli or Greek restaurant? Well why not read on and get to know how you can produce this delicious, rich dessert yourself. As this dessert is so rich and sweet, I always like to serve it with either a thick natural yoghurt, marscapone cheese or some creme fraiche . . . a few tart berries never go amiss either! In place of the orange syrup try making the Baklava with lime juice or some rose water. The nuts I have given may be replaced with your own favourites: pecans, hazelnuts, cashews, macadamias, etc. 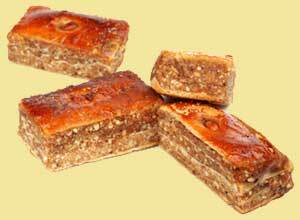 Enjoy your Baklava and bon appetit . . . . .